The Hanuman Stavan is a collection of stotras in praise of the powers, deeds and devotion of Lord Hanuman. 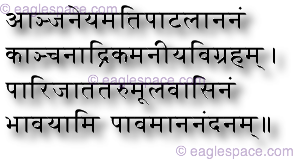 The stavan is separated into six main parts and the sanskrit and romanicized versions are given here to promote proper pronunciation and understanding. 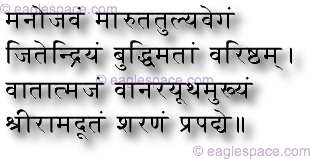 Sample audio clips (sung beautifully by Shri Anup Jalota) of each of the six parts are also included to aid in understanding of this beautiful dedication to Sri Hanuman. उल्लंघ्य सिन्धोः सलिलं सलीलं यः शोकवह्निं जनकात्मजाया. आदाय तेनैव ददाह लंका नमामि तं प्राञ्जलिराञ्जनेयम्.. I bow before the darling son of the god of wind, Who is the son of Anjana, Who is great among killers of ogres, Who is like a golden mountain, Who is handsome to look at, And who lives near the roots of Parijatha tree. yatra yatra raghunaathakīrtanaṃ tatra tatra kṛtamastakānjalim. 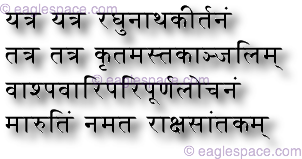 Whenever Lord Rama's (raghunaatha-) name is chanted (kirtanam-), you are present with your head bowed (krita-mastika-) and with devotion in your eyes (-anjalim). You, Lord Hanuman, always have your eye on the entire universe of your devotees through your divine and complete (paripurna-) vision (lochanam-). You are like the wind (marutim-) and the destroyer of the demons (rakshasa-) on this earthly plane.